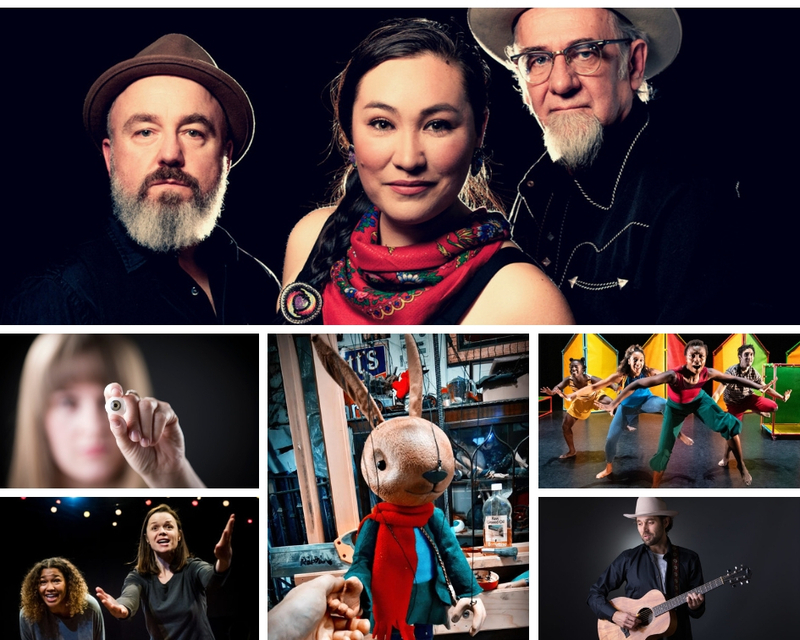 Spot On, Lancashire’s community touring network, have announced their spring season, taking professional theatre, dance, storytelling, music and family shows to the county’s village halls and libraries. This season’s offering features work from both home and abroad with artists travelling from Canada, India and Africa to perform in Lancashire venues. The opening show of the season is a brand new piece of children’s theatre, perfect for half term, called “Stripey Honey… is very yummy!” by Mashi Theatre. The show, which is brought to Lancashire by an arts project called Big Imaginations (with additional support from Burnley Youth Theatre and The Boo), has been created specifically for library spaces in a bid to encourage families to try something new in these familiar settings. The show will be performed at Accrington Library on Monday 18 February, Burnley Library on Wednesday 6 March and Haslingden Library on Thursday 7 March. With children and families in mind, Spot On will be hosting “Rabbit Girl and The Search For Wonder” by the 154 Collective. Audiences can sit around the campfire under a canopy while projections, music and puppetry happen all around them in this spellbinding performance. The show will be performed at Ormskirk Library on Thursday 21 February, Calder Vale Village Hall on Saturday 2 March and The Isaac Dixon Boathouse at Fairhaven Lake on Sunday 3 March. If a classic fairy tale is more your thing, Uchenna Dance are bringing “Hansel & Gretel” to St Joseph’s Parish Hall in Hoghton on Saturday 16 March. The company are bringing a modern dance twist to the much loved classical story with help from the Rural Touring Dance Initiative, which brings professional dance to remote areas of the UK. Spot On are also very pleased to be working with Northern Broadsides on a children’s version of Much Ado About Nothing entitled “A Muddle In Messina”. The play will be hosted at Heysham Library on Friday 8 March. Children will be invited to see the performance followed by a chance to stay and play with the digital resources which help to bring this version of Shakespeare’s classic to life. Canadian performers take centre stage in the programme this season, with no less than three brilliant companies heading across the pond to Lancashire. Borwick & Priest Hutton Memorial Hall, Ingol Library and Longton Library will play host to country musician Ryan Cook, when he brings his show “Having A Great Time” to their venues at the end of March. Croston Old School, Vicarage Park Community Centre and Heysham Library are welcoming Diyet and The Love Soldiers, an alternative folk trio from the Yukon, on Thursday 25 April, Friday 26 April and Wednesday 1 May. A more unusual offering is Stephanie Morin-Robert’s “Blindside”. Using storytelling, comedy, physical theatre and live projection, Stephanie recounts her tale as a feisty 7 year old with a glass eye and a zest for life. The show will be hosted at The Harris Museum, Art Gallery & Library on Wednesday 13 March. All of the Canadian shows have been brought to the country by a consortium of rural touring schemes of which Spot On is a member, in partnership with the Atlantic Presenters Association in Canada. A little closer to home, audiences can see the very early beginnings of rural touring with a visit to see Joan & Jimmy. The play tells the story of Joan Littlewood and Ewan MacColl as they founded Theatre Workshop, a travelling troupe of performers bringing radical theatre to rural England. The company will be visiting three Spot On locations, Halton Mill on Friday 8 March, Mellor Brook Community Centre on Saturday 9 March and Longton VM Club on Sunday 10 March. There’s more theatre in March with Out Of Chaos who bring their award winning, Greek legend-ary show “Unmythable” to Longridge, Clitheroe and Tosside. Up The Road Theatre will be performing their show “Peril At Sea” at Fairhaven Lake and The Bureau Arts Centre in Blackburn. If you love to be swept away in a story, there is a cavalcade of storytelling towards the end of the season with three different performances all falling under the storytelling banner. Our first offering is “Feral” by Sonya Moorhead and The Greyhounds – it’s all about missed opportunities and longing for adventure, with a folk music soundtrack played live by The Greyhounds. The show visits the ABC Memorial Hall in Hurst Green, Tockholes Village Hall and Garstang Library at the end of March. For more exotic climes you could be transported to the sights, smells and delights of Bombay, when Sita Brand invites you to hear her “Memories of an Indian Childhood”. The show is being hosted by two brand new Spot On venues – Brierfield Library on Thursday 11 April and Bolton-Le-Sands Library on Friday 12 April. In keeping with our commitment to developing new artists, we welcome back Louise Jordan to Lancashire with her brand new show “The Hard Way”. Her performance of music and song encapsulates the life story of Hannah Mitchell, who escaped domestic drudgery to become a campaigner, speaker, suffragette and magistrate. This powerful true story will be hosted by Bleasdale Parish Hall, The Barlow in Edgworth and at Whitworth Library towards the end of April. All the shows have been brought to the county by Spot On Lancashire, supported with funding from Arts Council England and Lancashire County Council. For more information about any of the shows call Lyndsey Wilson on 01254 660360 or email hello@spotonlancashire.co.uk. See the full spring 2019 season and details on how to get tickets at www.spotonlancashire.co.uk.